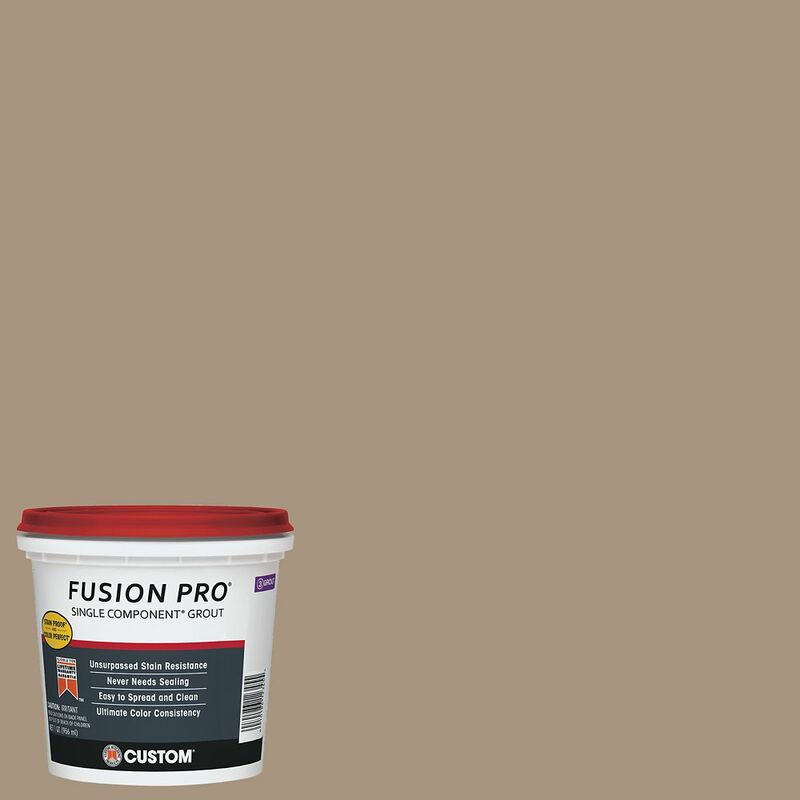 #145 Light Smoke Fusion Pro 1qt Custom Building Products Fusion Pro Single Component Grout is a professional grade, single component sanded grout. Fusion Pro requires no mixing and is ready to use on ceramic, porcelain, glass tiles and polished natural stone. It is suitable for exterior and interior wall and floor use. #145 Light Smoke Fusion Pro 1qt is rated 5.0 out of 5 by 2. Rated 5 out of 5 by knowitall from easy to use Bought this product to finish a bathroom reno in my home. went with Tobacco Brown. I liked the idea of not having to mix up anything, just open up the tub and grout. Nice tha it comes insmall tubs for small jobs. Very easy to use on the tile covering the alcove for my drop in tub. Lots of small joints to fill and this stuff is perfect. I will admit I use a slightly different install method then most. Cheap 1 1/2 inch plastic plastic trowel (the bright yellow kind you get at the dollar store!) that is usually used for drywall compound! Allows me to get the grout right into the joints without all the excess waste. Fill the joint, remove the minimal excess, a quick wipe or 2 with a grout sponge and final detail wipe with a damp paper towel and Voila..a neatly filled joint. I like the fact you dont have to seal it afterwards, which i have to do yearly with my other bathroom i used conventional grout on. (And yes I used the same install method, actually thats how i discovered it, after seeing how much grout I was wasting using a float while doing the wall tile in the shower, I switched to the plastic trowel and had it grouted in no time with almost no waste!!). Work on a small area at a time because it does set quick, but the results I think, are great! !.